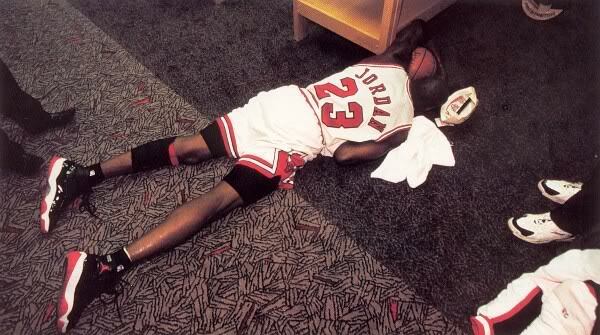 There’s an indelible image of Michael Jordan laying on the floor in the Chicago Bulls locker room minutes after winning his fourth NBA championship in 1996. His left arm is hugging the ball tight, his NBA Champions hat lay collapsed on its side, his exhausted tear-soaked face is hidden from the camera’s lens. He had just vanquished the Seattle Supersonics in six games, completing the long three-year journey from basketball icon to minor league outfielder and back again. During that time he lost his father, James Jordan, his hero and confidant. It was James who encouraged him to chase his childhood dream of playing baseball, to conquer something new all over again. Then on Father’s Day, of all days, after years of emotional strife and relentless work, Jordan’s reclamation was complete. There was nothing left to do in the wake of winning his first championship since his father’s passing but to lay there in tears, clutching the ball, rejoicing—or maybe, finally exhaling—at the completion of another arduous journey. It was a magical moment in a career full of them, and as we know, each moment is accompanied by a legendary sneaker. 63 points in the Boston Garden? There’s the “Chicago” Jordan I. Flying from the free-throw line in the 1988 Slam Dunk Contest? Takeoff courtesy of the white and cement Jordan III. Cementing the 72-10 Bulls as one of the the greatest teams in NBA history? Look no further than the black and red Jordan XI. In March of 1995, itching to get back onto the court, Jordan’s representatives sent a simple two word fax—“I’m back”—and the rest of the league was effectively put on notice. Jordan returned March 19 against the Indiana Pacers wearing the Jordan X and the number 45 on his jersey. After a few games of trying to find his spots, Jordan erupted for 55 points at Madison Square Garden against the Knicks. The Bulls would charge into the playoffs with a 13-4 record after Jordan’s return and promptly disposed of the Charlotte Hornets in the first round. Against the ascending Orlando Magic in round two, Jordan would suffer his first playoff series loss since 1990. He vowed to come back the following season better than ever, and that would require a sneaker worthy of joining him on the journey back to the top of the mountain. The XI, like most of the classic Jordan models, was designed by the legendary Tinker Hatfield. He was originally designing them while Jordan was away playing baseball, but he always envisioned that he would one day return and his creation would hit the court. Hatfield thinks it might be his all-time favorite shoe due to the technology associated with it. There’s a ballistic mesh upper, which was meant to make the Jordan XI lighter and more durable than past styles. The cordura nylon (or cordura mesh) material is ultra lightweight and manages to maintain its strength despite its elasticity. Back then, most basketball shoes were still clunky and Jordan always strove to have sneakers that let him fly unimpeded. There’s also a carbon fiber spring plate in the outsole, which helps get better torque when twisting on the court. The spring plate was typically made with plastics in the past, meaning it was durable but also heavier than Jordan would have liked. The carbon fiber solved that problem while also making it even stronger to withstand the rigors of a NBA game. But much like the unique elephant print on the Jordan III, the part that stands out the most about this sneaker is the surprising addition of patent leather. In general, patent leather is lighter than genuine leather and tends not to stretch as much. That helps keep the foot stable during directional changes on the court. Hatfield noted that many times Jordan’s foot would roll over when leaning too far in one direction, so he wanted to make something durable and stable for him when he would push his sneakers to its limits. Hatfield also wanted to create something that Jordan would wear both on and off the court, and the XI does sport a more formal look than its predecessors thanks to that patent leather shine. Jordan once said that someone would wear them with a tuxedo one day and he was right. For the last 20 years, men of all ages have worn these shoes with prom tuxes and on red carpets. Boyz II Men wore the Concord Jordan XIs at the 1996 Grammy Awards. My own brother wore a pair at his wedding reception. During the 1995 playoffs, Jordan insisted on wearing Hatfield’s samples even though both he and Nike tried to convince him otherwise. Jordan couldn’t resist. He was so enamored with them that he didn’t even care that he was incurring fines from the NBA every time he wore them. Jordan was wearing the white and dark concord colorway (better known as “Concords”) while the rest of his team was wearing all black shoes. Each game he had to pay a $5,000 fine. It wasn’t the first time Jordan was fined for his sneakers, as his original Jordan Is were famously “banned” in 1985. Finally, Nike gave him a black colorway so he could comply with the dress code. The Concord colorway of the Jordan XI was the first to be released to the public in 1995, with the Black/Red and White/Columbia Blue versions following in 1996. Jordan donned the White/Columbia Blue pair for the All-Star Game in San Antonio, where he won MVP. It was the only time he wore that colorway in a game in his career. Capitalizing on the shoe’s popularity, Nike and Jordan released low-top versions of the Jordan XI in 1996 with modified features. On the Jordan XI IE Cobalt, the patent leather is replaced by elephant print and mesh panels. The black and red iteration ditches the patent leather for mesh panels as well, but keeps the white midsole and red Jumpman on the tongue like it’s high-top counterpart. It wouldn’t be an iconic Jordan without some savvy advertising attached to it. The main spot for this shoe was Jordan staring down a 100-foot hoop. He takes off, charging towards the basket. He leaps and continues to climb through the air until he finally hits the insanely high net. He flushes the dunk through and holds on as the ball falls and falls to the ground below. Jordan fixes his eyes to the camera, no way he’s letting go. After the initial run was over in 1996, colorways began to retro in 2000 with the “Concord” and the with official debut of the “Space Jam.” 2001 was a big year for the Jordan XI, as we saw retro versions of the White/Columbia Blue and Black/Red colorways, the “Cool Grey” model debuted and many different low-top patent leather options emerged in a variety of colors for men and women. The Jordan XI releases of that year were instrumental in creating the retro culture that’s so popular today. Since 2006, at least one Jordan XI has been released every single year, whether it be individually or part of a pack. Since 2008, Jordan Brand has made the XI the centerpiece of its holiday release calendar, releasing a different colorway every single year right around Christmas. It’s always the best-selling general release Jordan of the year for the company, as each sneaker routinely sells out immediately. It doesn’t have to be an original colorway for the shoe to sell out either. 2015’s “72-10” XI sold over one million pairs, bringing in over $130 million in revenue for sneaker retailers. 2014’s “Legend Blue” Jordan XI fared even better, bringing in over $140 million, albeit on less physical units sold. The popular “Win Like ‘82” and “Win Like ‘96” models sold out immediately in 2017. The “Gamma Blue” Jordan XI sold out in typical holiday fashion back in 2013. Even a “Cap and Gown” (aka “Prom Night”) version sold out back in May, with Jordan Brand capitalizing on the formal nature of the shoe coinciding with graduation and prom time. The “Concord” is rumored to make a return as the cornerstone of this year’s holiday release schedule, which will no doubt continue Jordan Brand’s successful streak around the holidays. When the Concords originally released in November 1995, they retailed for $125. Despite the hefty price tag for the time, people still lined up all over the country to grab a pair. This holiday season they’ll retail for $220, and despite multiple retro versions over the past two decades, the fascination with one of Jordan’s most popular silhouettes remains the same. Over one million pairs are rumored to be releasing in men’s sizes alone. The Bulls blitzed through the league in 1995-96 en route to a 72-10 record, then the best in NBA history. They breezed through the Eastern Conference playoffs, catching only one loss en route to the championship series with Seattle. In the NBA Finals, the Bulls beat the Supersonics in six games, capping off the greatest season ever. Jordan himself won the MVP triple crown that year, taking home the regular season, All-Star Game and NBA Finals MVP honors en route to his fourth NBA Championship. It was the season he had been building towards. He had officially reclaimed the throne. Then there was that moment on the floor in the locker room. A triumphant and sobbing Jordan, emotionally and physically drained at the completion of the journey. A moment, like so many others from his illustrious career that you couldn’t have scripted better yourself, and just like all the others, he had a sneaker that encapsulated that particular moment perfectly.